Listen to the Reflection here! Hail, full of grace! The Lord is with you. But Mary said to the angel, “How can this be, since I have no relations with a man?” And the angel said to her in reply, “The Holy Spirit will come upon you, and the power of the Most High will overshadow you. Therefore the child to be born will be called holy, the Son of God. 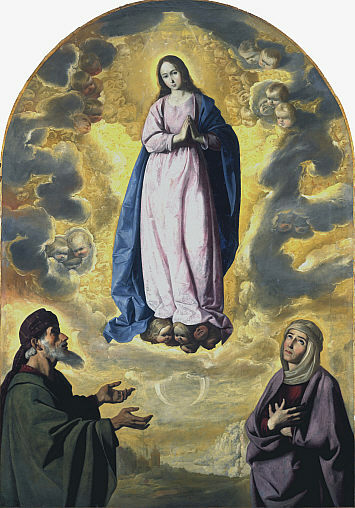 And behold, Elizabeth, your relative, has also conceived a son in her old age, and this is the sixth month for her who was called barren; for nothing will be impossible for God.” Mary said, “Behold, I am the handmaid of the Lord. May it be done to me according to your word.” Then the angel departed from her. of the Noblest One, the sky’s King. living under the heavens, and of all hell-dwellers. thy maidenhood, give it, sinless. with ever pure heart her bright treasure. and thou, Maria, forever and ever be help unstained. This article was published on Tuesday 08 December, 2009.